Have you ever felt like life is total darkness? I’ve felt that way often. When life is dark, it feels like you’re living (or surviving) at the bottom of a pit with no hope of escape. Everywhere you turn, there’s a wall, something keeping you from moving forward, out of the darkness. When I was eight months pregnant, my husband died. I was the pregnant widow with the two year old at home. If I hadn’t lived it, I would insist it was the storyline of a made-for-tv movie and not real life. The day I left the hospital without my husband, my heart broke. It broke because I wasn’t going to spend the rest of my life with the man I loved and who loved me. It broke because there was a little boy at home who needed his daddy. It broke because there was a little girl who wasn’t even born yet who would never meet him. The month after my husband died and before my daughter was born were total darkness. I remember lying in bed, staring at the ceiling, telling God he was wrong. He didn’t design families to be broken, but he let mine shatter. Have you ever told God he was wrong? Maybe you watched a dream die or said goodbye to someone you love. Maybe you didn’t lose something tangible or maybe you did. Really, what drove you into the darkness doesn’t matter as much as what you decide to do in the darkness. In the pit, are you digging in deeper or are you looking for the light? 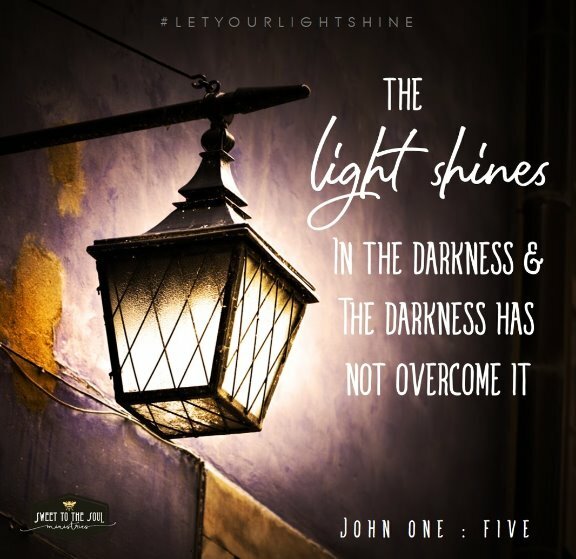 ​According to John 1:4-5, Jesus is light. The life that he gives is the light that breaks through the darkness. The verse continues to say that the darkness cannot overcome the light. ‘Overcome’, in the original Greek, means to comprehend, understand, or detect. Do you realize that Jesus is so full of life that the darkness cannot comprehend, understand, or detect him? Our darkest hours don’t magically disappear. Struggle remains and life can be so incredibly difficult. But how does your attitude towards struggle change when you realize that your darkest pit is not deeper than God’s love for you? God’s love rescues me from the pit, but he doesn’t require us to forget or ignore our hurting. He is full of compassion and grace and is not offended by our honest emotions. I love Psalm 40:1-2 and how God not only hears our cries and rescues us from our pit, but he puts our feet on solid, sturdy ground. There’s no darkness that is too much for God’s love. And God’s love makes us more than conquerors. 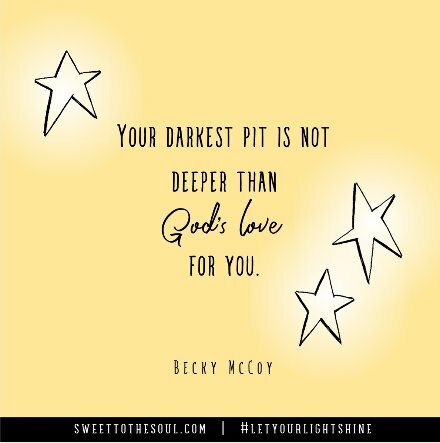 At the bottom of your darkest pit, you can cry out to God, he will hear you, and he will set you on sturdy ground. His love rescues you and gives you strength and courage. Dear God, thank you for loving me when I am unsure of you. Thank you for choosing to rescue me from my deepest, darkest pits and setting my feet on sturdy ground. Your love gives me strength and courage – help me choose to accept and look towards the light that is your love. In Jesus’ name, Amen. ​Becky L McCoy lives on the Connecticut coast with her two precocious and hilarious children. She once enjoyed teaching high school physics and now tells her story of loss, grief, and joyful living on her blog. 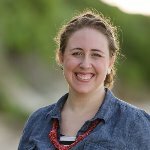 Having struggled with depression and anxiety and experienced several seasons of grief and struggle, Becky is passionate about creating an online community where people share their stories and encourage one another to choose to live bravely and authentically at BeckyLMcCoy.com and her podcast Stories of Unfolding Grace.